Except for a maternity break in 1972, Cindy Birdsong remained with The Supremes for many years. She was a constant for the trio, often serving as a buffer between her singing partners whenever tensions ran high, and her contributions to the group’s success are, in my opinion, somewhat overlooked. She never had a full lead on any of The Supremes’ albums and she’s the only Supreme who’s never released a full length solo LP. In 1987, she did travel to London where she recorded an EP for Hi-Hat Records with a lead track that sounded fabulous. 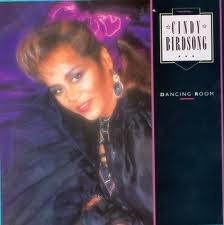 Dancing Room really showcased Cindy’s lovely soprano and her vocals were very fresh, very powerful on this song. She recorded a few other songs for the EP, but Dancing Room was the only one that made any noise. A minor hit in the UK, it didn’t receive any attention here in the US and Cindy didn’t follow it up with any more recordings for Hi-Hat. Dancing Room is one of my favorite songs by any former Supreme. It’s exciting and it really made use of the post disco dance groove of the late 80’s. Even now it still makes you want to get up and move. Cindy was at home on this material and the result is a small classic all her own.